Although Salzburg and Vienna often get all the attention, Linz has somehow flown under the radar and flourished. This stunning Austrian city with beautiful pastel colored buildings and grand churches is far from what you might find in Austria as it has a modern edge underneath all this beauty. Throughout Linz, you’ll find many cool local boutiques run by younger entrepreneurs as well as new cafes catered to the next generation. Most importantly, Linz has not suffered from the overtourism that you find in some of the major cities in Austria. You do get a fair share of tourists who cruise, but you can generally step onto a sidestreet only to find quiet and beauty in the historic city center. The Linz historic city center is absolutely beautiful and if you only have a short time in Linz, I recommend staying in the city center to be able to easily walk to the main attractions in the city as well as restaurants. Those seeking comfort and value might like the family-run boutique hotel Hotel zum Schwarzen Bären while those looking for a room with a view might love the view of the historic Mariendom Cathedral at Hotel Am Domplatz. If you’re looking for a different experience, cross the river to stay in Urfahr, the other bank of Linz. Linz is at the cutting edge of design and you can experience it through one of its many design-oriented hotels. For those on a tighter budget, there’s just one hostel in Linz. If you only have a day in Linz, I’d recommend focusing on the old town, eating some Linzertart, stop for a coffee at one of the many coffeehouses, getting a Hugo at one of the many cafes, and visiting the Pöstlingberg. If you’re on foot, this should be sufficient for one day. For some reason, Austrian breakfast isn’t something that people talk about. Many people enjoy some bread with butter or jam, however you can also find a more elaborate breakfast that includes ham, cheese, and breads. A friend of mine recommended Cafe Meier, which is a traditional Austrian restaurant in the city center that serves a nice breakfast as well as good coffee. (Be warned: No cell phones and no cards.) We thoroughly enjoyed our omelettes. For something a bit more modern, head to Exx for a modern vegan-friendly take on Austrian breakfast. Here, you can find vegan worst as well as other traditional Austrian food that you can order by the dish. Coffee in Austria is an art that is recognized by UNESCO. You’ll find a number of traditional Viennese style coffee houses. My favorite that I visited was Café Traxlmayr, which has lactose-free milk available and accepts cards. They have a lovely view of the pretty pastel buildings in Linz’s center. If you want to order coffee in Austria like a local, ask for the Melange, a frothy Austrian take on the cappuccino that is pure deliciousness. For those of you who like your coffee black (like your soul), order the Kleiner Brauner for an espresso. At least for me, this is why I kept coming back to Linz: for the enjoyment of walking around this clean and beautiful city. It’s hard not to admire the stunning facades of the buildings. It’s very hard to miss the Hauptplatz, the main square of Linz. Here, you’ll find colorful houses, an beautiful decorative column made of marble, and quite a few cafes. From here, it’s easy to wander admiring the architecture, step into charming shops, and watch the world go by at. Look for the decorated pink building with an octagonal tower, which is the old city hall (Altes Rathaus) where you’ll find the tourism office (in case you need a map.) Just a short walk away from the Hauptplatz, you’ll find the Danube. The stunning Linzer Landhaus, built starting in 1568, can be visited through by anyone visiting Linz. It was built on top of a former monastery that was mostly destroyed although a small portion of the original building remain today. This building was a key place for education for a brief period into the 1600s where renown scientist, Johannes Kepler, taught. Most of the building was redesigned in the Baroque style following a fire that destroyed much of Linz in 1800. As of 1861, this historic building has been the seat of the Upper Austrian government. Be sure to peek inside the stunning courtyards where concerts are held. Landstraße is the heart of Linz’s shopping district although you’ll find more independent shops along Altstadt. I ended up stepping into the ALEX – eine Buchhandlung bookstore to browse for books. For something unique head to Altstadt 11 – concept store. I also enjoyed browsing at Mobiliar & Raritäten Isolde for retro furniture and household items. For truly unique experience, experience the rooftops of Linz complete with artwork. For Höhenrausch, you’ll walk through and across the rooftops of quite a few buildings in Linz while viewing artwork from Austrian and international artists. This includes seeing the ceiling of the cathedral and epic views over the city. Families get reduced admission if going as a group although admission as of 2018 costs 12 euros per adult. Note: This is only possible between May and October, so check the yearly exhibition for updates regarding the newest installations. Linz is at the heart of the Austrian steel industry and it is not surprising that the “Museum of the Future” is located in Linz. The innovative museum is covered in LED lights that allow the building to act as an art piece itself. Inside the museum, you’ll find exhibits dedicated to biotechnology, robots, and technology related to solving human issues. There are also temporary exhibits by engineers and artists showcasing the latest in technology. The center is not just a museum, but an active research site. Can you visit Linz without having Linzer Tart? Linzer Tart is said to be one of the oldest cakes in the world with recipes dating back to 1653. Linzer tart is made with redcurrants in Linz, which surprised me as I was used to having it with raspberries in the United States. You can find Linzer tart at a number of bakeries around the city, however I was drawn to the stunning interior/exterior of k.u.k. Hofbäckerei, a beautiful traditional cafe run by master baker Fritz Rath. This baker inherited this recipe from his family who supplied baked goods to Archduke Peter Ferdinand. Pöstlingberg and Linz Castle sit across the Danube with a stunning view over the city from above. Is a visit to Linz complete without crossing the river? Linz castle is said to date back to 799 although not all of the walls are original due to the Great Fire mentioned above. Inside, you’ll find a museum covering the culture of Upper Austria as well as artwork. Even if you’re not a museum lover, be sure to get a coffee or make a reservation for a nice meal here as the restaurant inside of the castle one of the best views over the city. The Pöstlingberg is a pilgrimage church dating back to the 18th century that was renewed fairly recently. It can be easily seen from various points in the city. The interior is beautiful with elaborate frescos dedicated to Mary. The terrace of the church has one of the best viewpoints over Linz… It’s free to enter although depending on whether you choose to take the tram up or walk, it may not be free to visit. One of the more bizarre things to do in Linz is to take the Grottenbahn. 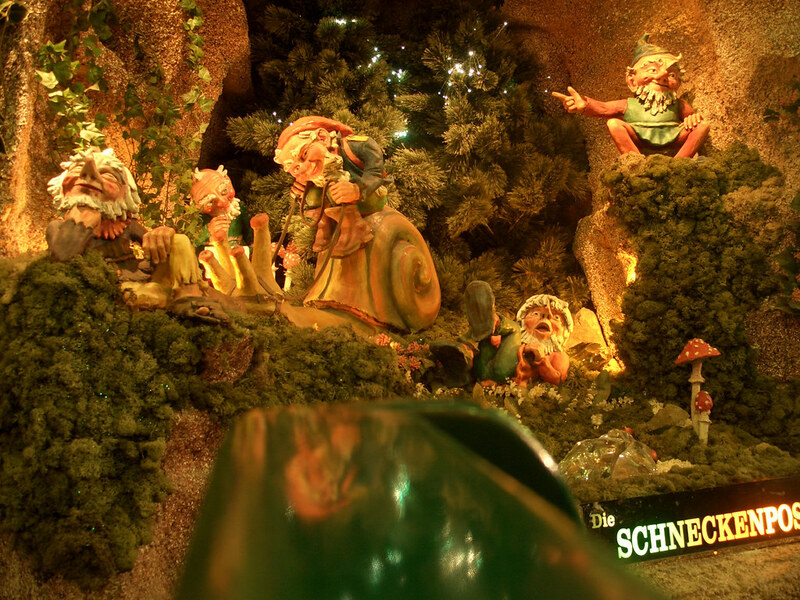 This nostalgic ride that dates back to 1906 has an interesting ride through a world of evil dwarves, taxidermied animals, and dragons… Simply, you need to see it to believe it. Seriously, go figure. The last thing that I expected from Linz was authentic Mexican food. At the recommendation of a friend from the US who lives in Linz, I ended up heading to Taco Buddies. This taco place with authentic food from the Yucatan region and craft beer place has affordable prices, a ridiculously friendly owner, and delicious food. Note: for my vegan readers, I recommend Front Food. This new vegan restaurant just around the corner from Taco Buddies has some great vegan takes on food, including vegan BBQ. One of the simplest yet romantic things to do in Linz is to stroll along the riverbank. There’s just something about the Danube that draws you in… In Linz, you’ll find a promenade for biking as well as walking. There are a few charming cafes with a view to admire the view from. Linz has a burgeoning craft beer scene that I was surprised to find. I loved the beer at Beer Buddies, a Linz microbrewery that shares a location with the Taco Buddies location mentioned above. Otherwise, check out die Marktbrauerei for delicious IPAs. For a drink, head to Chelsea Pub for the best selection. READ MORE Gatsby's Long Island: Gorgeous Gold Coast mansions that you must see! To truly drink like a local, be sure to order a Hugo while dining out. The Hugo is a refreshing combination of sparkling white wine, elderflower syrup, sparkling water, mint, and lime. It’s the perfect refreshment for a hot day. As Jacob has a mathematics background, we had to find the Johannes Kepler house at Rathausgasse 5, which sits within the historic city center of Linz. Kepler spent quite a bit of time in Linz, where he discovered the Kepler Laws that govern the orbits of planets. (Kepler’s Third Law of planetary motion is his most famous.) It’s not possible to do much more than see the exterior of his former home, which has been modernized, however the house is now used as a cultural center. Linz’s harbor is full over a hundred street art. You can discover this stunning street art by boat or on foot with a guided walking tour showing off artwork by famous artists from all over the world. If you’re interested in street art, be sure to stop off in Linz and to leave time for seeing one of the biggest graffiti galleries in Europe at Mural Harbor. The easiest way to get into Linz is by train. The train between Salzburg and Vienna stops in Linz, so if you’re looking to save money on Austrian trains, consider booking a discounted ticket to stop in Linz on the way. It’s a 20-30 minute walk from the train station to the town center. If you’re staying in the area, Linz is well connected by bus to the surrounding towns, including Mauthausen. For those with a car, you can easily park in the city center at many of the paid parking lots. We were able to park for a couple of euros as we explored the city center by car. You can fly into Linz with Austrian or Lufthansa, most likely with a layover in Frankfurt or Vienna. Have you been to Linz, Austria?